Trump’s bigoted base, by the numbers. The president’s racist base, by the numbers. 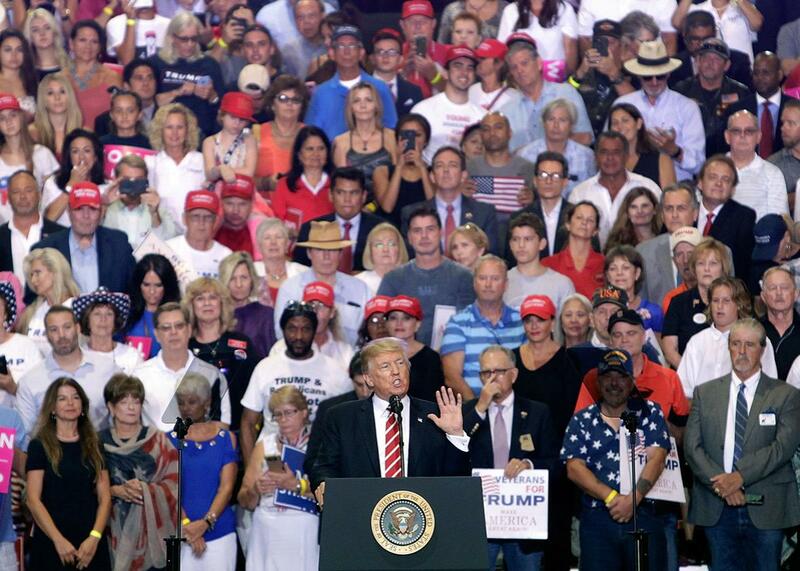 President Donald Trump speaks to a crowd of supporters at the Phoenix Convention Center during a rally on Aug. 22 in Phoenix. Since Charlottesville, several pollsters—Quinnipiac University, the Washington Post, Public Policy Polling, Marist (for NPR and PBS), and Morning Consult (for Politico)—have asked Americans what they think of explicitly racist groups. Let’s look at what these surveys have found. Do you like Nazis and the Klan? Since Nazis and the Ku Klux Klan are directly associated with hate and murder, very few people will tell pollsters that they like or support these groups. If you look at various subsamples in the Marist survey, for instance, only 1 percent of whites, 1 percent of Republicans, and 1 percent of conservatives say they mostly agree with the Klan’s beliefs. But among people who approve of the job Trump is doing as president, 4 percent openly agree with the Klan. In the PPP survey, 1 percent of people who voted for Hillary Clinton in 2016 express a favorable opinion of neo-Nazis. Among whites, 4 percent express such an opinion. Among people who voted for Trump, however, it’s 7 percent. (This doesn’t mean some of those Trump voters are nonwhite. It just means that Nazi sympathies among whites are concentrated in the pro-Trump contingent.) In the Morning Consult poll, 3 percent of conservatives, 5 percent of whites, and 6 percent of Republicans admit to a favorable impression of neo-Nazis. Among people who strongly approve of Trump’s performance, the number goes up to 12 percent. Remember: These are the people who are willing to tell a pollster that they sympathize with Nazis. The poll doesn’t show how many others are concealing such views. Are racist views acceptable? The Post survey asks whether it’s “acceptable or unacceptable to hold neo-Nazi or white supremacist views.” This question focuses on what you considerable tolerable, as opposed to what you believe. Again, respondents who strongly approve of Trump’s performance stand out. (The Post poll, like the Morning Consult poll, distinguishes strong Trump approvers from soft ones.) Seventeen percent of them say it’s acceptable to hold such views, compared to 13 percent of Republicans, 12 percent of conservatives, and 9 percent of whites. Do you like white nationalists? When you change the language from supremacists to nationalists, some people who hesitate to espouse superiority admit that they want separation. In the Marist survey, this makes little difference: Seven percent of Trump approvers, compared to 5 percent of Republicans and 4 percent of whites, say they mostly agree with the beliefs of white nationalists. But in the Morning Consult poll, the gap is bigger. Nineteen percent of strong Trump approvers, compared to 10 percent of Republicans and 8 percent of whites, say they have a favorable impression of white nationalists. Can white supremacists be fine people? Trump’s comment about people who rallied with neo-Nazis in Charlottesville—that some were “very fine”—inspired this question in the PPP survey: “Do you think it is possible for white supremacists and neo-Nazis to be ‘very fine people,’ or not?” Four percent of Clinton voters say it’s possible. Among whites, the number goes up to 13 percent. Among Republicans, it’s 18 percent. Among Trump voters, it’s 22 percent. Would you protest? The Quinnipiac survey asks: “If a white supremacist rally were to occur in your town, would you join the rally, protest the rally, or would you do neither of these things?” Overall, Trump approvers are no more likely than non-approvers to say they’d join such a rally. (Three percent of strong Trump approvers say they would join it, compared to 2 percent of non-approvers, but this is well within the margin of error.) But there’s a huge gap in inclination to protest. Fifty percent of non-approvers say they would protest such a rally. Only 13 percent of Trump approvers say they would do so. Who’s to blame? Strong Trump approvers are the only constituency more likely to blame anti-racism protesters than the racists themselves for what happened in Charlottesville. Quinnipiac’s survey asks: “There were two major groups involved in the situation in Charlottesville: the white supremacist protesters, and the people who were there to protest against them, known as the counter-protesters. Who do you believe is more to blame for the violence in Charlottesville: the white supremacist protesters or the counter-protesters?” White respondents blame the supremacists, 59 percent to 18 percent. Republicans also blame the supremacists, 38 percent to 30 percent. But Trump approvers blame the counterprotesters, 35 percent to 27 percent. This gap persists even when the question mentions that a counter-protester died. The Morning Consult poll asks: “A group of ‘white nationalist’ protesters recently organized a rally in Charlottesville, Virginia that turned violent when one counter-protester was killed. Based on what you have seen, read, or heard, who do you blame most for the events in Charlottesville, Virginia?” White respondents blame the white nationalists, 40 percent to 9 percent. 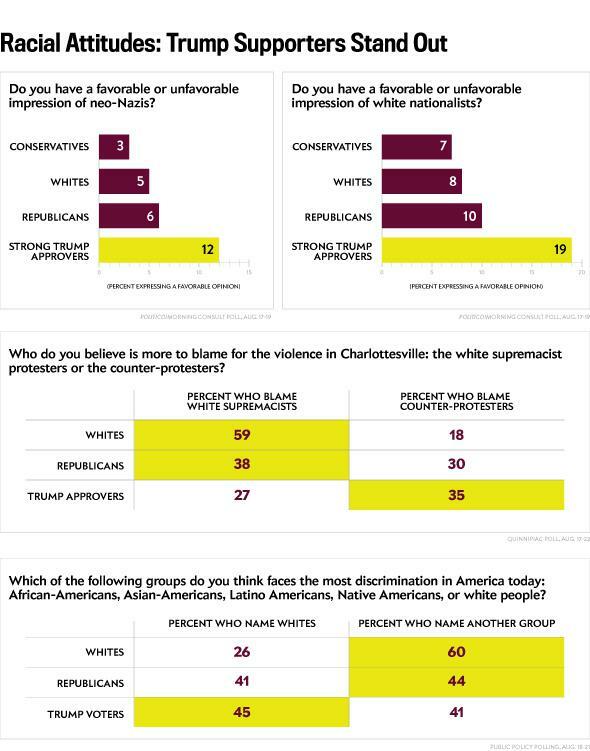 Republicans also blame the white nationalists, 24 percent to 12 percent. But strong Trump approvers blame the counterprotesters, 20 percent to 14 percent. Are whites the real victims? Beyond Charlottesville, Trump fans are distinct in believing that whites, not minorities, are the true targets of prejudice and discrimination. The PPP survey asks, “Which of the following groups do you think faces the most discrimination in America today: African-Americans, Asian-Americans, Latino Americans, Native Americans, or white people?” Twenty-six percent of white respondents say whites face the most discrimination; 60 percent of whites name one of the other groups instead. Among Republicans, 41 percent say whites are the principal victims, but 44 percent choose a different group. Only among Trump voters does a plurality—45 percent to 41 percent—say that whites are the principal victims. In the Quinnipiac poll, whites are far more likely to say that “prejudice against minority groups” is a very serious problem (42 percent) than to say that “prejudice against white people” is a very serious problem (16 percent). Republicans tilt slightly the other way: 25 percent say prejudice against whites is a very serious problem, while 21 percent say prejudice against minorities is that serious. Among Trump approvers, the shift is more pronounced: Twenty-eight percent said anti-white prejudice is very serious, while only 19 percent say the same of prejudice against minorities. When you put all these numbers together, they suggest two things. First, the most likely predictor of overt racism isn’t being white, conservative, or Republican. It’s supporting Trump. Second, among Trump fans, the racist constituency is significant. Twelve percent of strong Trump approvers express a favorable opinion of neo-Nazis, and 19 percent express a favorable view of white nationalists. Twenty-two percent of Trump voters say some white supremacists are “very fine people,” and 45 percent—a plurality—say whites face more discrimination than other groups do. If Trump were to alienate these people, he’d lose a big chunk of his support. In the Morning Consult poll, he has a 39 percent approval rating. Many of the people in that 39 percent—more than 5 percent of the total sample—express a favorable view of white nationalists. Without their backing, Trump’s approval rating would fall below 34 percent. And the damage would cost him one-fifth of his base. Twenty percent of the Morning Consult sample strongly approve of Trump’s job performance. Without white-nationalist sympathizers, that number would drop to 16 percent. I think there’s plenty of evidence that Trump is prejudiced. I also think a lot of his foot-dragging after Charlottesville was driven by ego, not animus. But regardless of his personal feelings, these polls make one thing clear: As his base shrinks, he’s more and more dependent not just on whites or conservatives, but on explicit racists.